Remember the TV ad with a stack of champagne glasses balanced on the hood of a Lexus? Back in the late 1980s, the upstart Japanese brand had a lot to prove about refinement and build quality, not to mention their ability to keep company with the world’s top luxury carmakers. After selling countless bulletproof sedans and SUVs in the intervening decades, Lexus is aiming their guns at a sexier target: high-end sports cars. While the late, great $375,000 LFA took a decade to develop and only saw 500 cars built, the more mainstream LC 500 targets six-figure sleds like the Porsche 911 and the Mercedes-Benz S-Class Coupe. Though Lexus primed the pump two years ago with the $40,000 RC, the LC 500 is estimated to start at around $100,000, punching way above the RC’s weight by targeting well-heeled sports car connoisseurs. So does it deliver? We sampled the 2018 Lexus LC in southern Spain to find out. Unlike the long-gestating LFA, the Lexus LC was inspired by the LF-LC Concept, which debuted at the 2012 Detroit Auto Show. Pleasingly, little has been diluted between the pie-in-the-sky concept car and the real world ride: the LC has nearly identical proportions, with a “spindle” grille that looks like it was poured onto the car, swoopy contours, and a cocoon-like cabin. Debuting Lexus’s so-called Global Architecture Luxury platform, a rear wheel-drive setup that will be used in future vehicles, the LC is available in two versions: the 295 horsepower LC 500 h V6 hybrid, and the 471 horsepower LC 500 V8. While the hybrid targets the eco-conscious, the V8 is the all-out performance car, achieving the 60 mph sprint in only 4.4 seconds. Interestingly, both models offer 10-speed gearboxes, though the hybrid uses a first of its kind transmission Lexus calls a Power Split Device, which combines four conventional gears with a continuously variable transmission. The LC’s slinky styling stands out. The low-slung 2+2’s sheetmetal is strikingly curvaceous, with an attention-grabbing, anime-like presence; inside, the cabin is artfully sculpted, with concept car-worthy details including a streamlined, floating door handle, pleated Alcantara door surfaces, and a leather and aluminum-wrapped gearshift knob. Settle into the driver seat, and there’s an impressively comfortable feel from the sleek perch. As you might expect from a Lexus, the controls have a sheen of smoothness to them, while real metal surfaces and soft leather add to the expensive feeling. Though the V8 offers plenty of seamless power augmented by a buttery exhaust note, the ride is quite firm, especially over broken roads. There’s some noticeable shift action when the 10-speed swaps gears, but the prevailing theme in the LC 500 is one of Teflon-coated polish— less like a lightweight, maneuverable Porsche, and more like a sedate but fleet Mercedes-Benz super-sled. While the V8’s all-natural exhaust note sounds lusty and nicely modulated, the hybrid’s is almost too good to be true — because it is. The hybrid’s honeyed sonics come from a computer algorithm that smoothens the engine sounds by using the stereo system to cancel out ill-sounding frequencies. The result is a sweetly smooth race car-like sound that’s almost sing-songy in its acoustic perfection. At Circuito Monteblanco, a track just outside the city Sevilla, the LC 500 behaves with potency and predictability. Though it doesn’t turn into corners with the sharpness you might expect — this is, after all, more of a grand touring car than a tightly wound sports car — its chassis is composed and feels solidly planted. “Frankly, most of our owners don’t track their cars,” one Lexus rep reminded us, a fact we wouldn’t dispute. That said, while the LC can’t quite stand up to more sharply honed performance cars at full-tilt track driving, it’s exactly where you’d want it to be on a long, all-day driving excursion: swift, smooth, and ready to tussle with a challenging set of twisty roads. 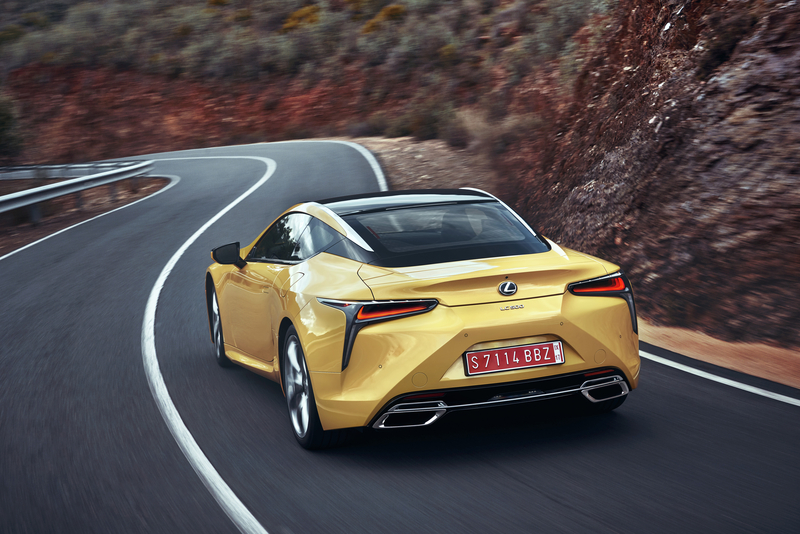 Though not the ideal track weapon, the new Lexus LC 500 achieves its broader mission of pulling off strong performance, elevated design, and a premium feel, with the impression that there may as well be a delicately stacked set of champagne glasses resting on the hood.